I think I know what they mean by "non-gender"--children who choose not to conform to any gender expectations...at least I'm assuming this is what they mean. Still, the term "non-gender" is not only unspecific, it's also rather strange...especially given the fact that the clip art at the top seems to be that of a little boy and little girl, and not of any child indistinct or ambiguous. I guess their phrasing is as non-conforming as their intentions. I'm not sure where this sign is from, but much thanks to John Bird, a humor scholar and fellow Carolinian, who alerted me to this image on FAIL Blog. 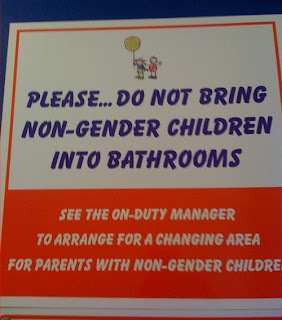 Someone on FAIL Blog has posited that the sign is really asking people not to take children of the "wrong" gender into the restrooms: girls into the men's room, boys into the women's room. But "non" doesn't mean "opposite", so I really don't know what they were going for here, and the dearth of Googits for "non-gender children" doesn't help. You'd think at least there'd be some online support groups.